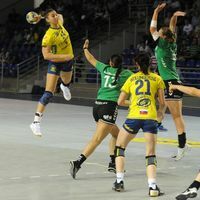 Two teams have already qualified for the Women’s EHF Cup Qualifying Round 2 following their comfortable wins in double-headers which took place on Saturday and Sunday. Issy, who had participated in the competition’s group phase last season, agreed to play both legs against FYR Macedonia’s Metalurg in Skopje. However, that did not stop the French side from totally dominating on court. After winning 33:15 in the first leg, they went on to claim an even more emphatic victory on Sunday, 33:11, in a game where Metalurg scored just once in the second half. Michalovce played both matches against the Dutch VOC Amsterdam at home. Similar to Issy, the team from Slovakia practically removed all questions already on Saturday as they won 37:24. The following day, Michalovce somewhat relaxed their approach, but had no problems officially booking a ticket to Round 2 with a 30:26 win. In three other ties, everything is still open ahead of the second legs, which will be played next weekend. Zvezda Zvenigorod were seen as favourites at home against Zug, but the Russian team struggled in the first half, which ended in a draw, 14:14. However, Zvezda improved after the break, so the 30:24 win give them confidence heading into the game in Zug. Stockerau are now in a similar position to Zvezda, as they beat Slavia Praha at home with the same 30:24 score. Unlike Zvenigorod, the Austrian side dominated already before the break and were up by five goals (16:11) at half-time, only to further extend their lead in the second half. H65 Höörs, who played in the EHF Cup Group Phase last season, face a testing second leg. Lokomotiva Zagreb stayed within four goals of the Swedish club, 22:18, and have a chance to turn things around at home in the second leg.